The mass desertion followed the Bharatiya Janata Party's decision not to grant party ticket to state General Secretary Jarpum Gamlin, state Home Minister Kumar Waii and Tourism Minister Jarkar Gamlin for the Assembly elections. 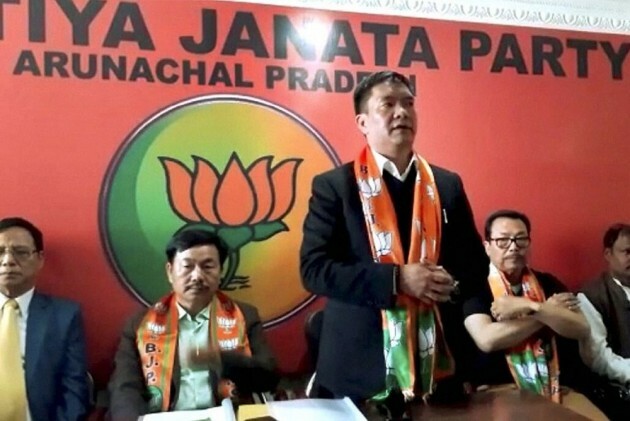 In a major setback to the Arunachal Pradesh BJP on Tuesday, 15 of its leaders including two ministers and 12 other sitting legislators joined the National Peoples' Party (NPP). The mass desertion followed the Bharatiya Janata Party's decision not to grant party ticket to state General Secretary Jarpum Gamlin, state Home Minister Kumar Waii and Tourism Minister Jarkar Gamlin and several other sitting legislators for the Assembly elections. The BJP's Parliamentary Board had on Sunday released a list of 54 candidates for the polls to the 60-member-assembly, which are being held simultaneously with the Lok Sabha polls in the state on April 11. On Monday, Jarpum Gamlin dashed his resignation letter to BJP's Arunachal President Tapir Gao. He was camping in Guwahati since Monday morning where Meghalaya Chief Minister Conrad Sangma met him and other disgruntled leaders on Monday night. "Jarpum, Jarkar, Kumar Waii and the 12 sitting MLAs of the BJP met the NPP General Secretary Thomas Sangma on Tuesday and joined the NPP," a senior NPP leader said in Guwahati, adding that the party is very hopeful that the inclusion of these leaders would strengthen the party. Meanwhile, the NPP has decided to field candidates in all the 25 Lok Sabha seats in the northeast for the forthcoming Lok Sabha polls. While the party has released its list of candidates for Meghalaya, it is likely to release its list of candidates for the rest of the constituencies soon.